In order for the FUSE mount to be exposable to the host and other docker containers, these settings have to be in the Extra Parameters option in the "Advanced View" when setting up the Docker. I've already made them default in the CA template file. Feel free to post any questions/issues/requests relating to this docker in this thread. Can I use my encrypted ACD/GDrive content with Plex and other dockers? Yes, that's exactly the purpose of this container. Can i haz unlimited space on my unRAID setup? I think 233 TB is the maximum I've seen so far with Amazon Cloud Drive. How do i create the .rclone.conf file? I already have a .rclone.conf file from the rclone plugin, can I use it rather than creating a new one? Make sure that this docker container is started before the container you are sharing the volume with. Can i use the copy/sync features of rclone with this docker? Use the other docker i made which supports that. What are the best mount settings for Plex playback / transcoding? This is not entirely documented yet by rclone, but there is some discussion here. Why should I specify the /data mount in the Extra Parameters? Because the unRAID docker GUI does not support the shared mount propagation options, which is required for the rclone FUSE mount to be shared with other containers. I've already opened a feature request to have this option available in the GUI. This option has been added to the GUI by @bonienl and is no longer necessary. Can I change the volume mapping of the mount from /mnt/disks/rclone_volume/ to another location? This looks very interesting. I didn't have a lot of luck getting the plugin working how I wanted so I hope this is more successful. Thanks for the hard work on this. Sure, I'd be happy to receive some feedback on this once you get it up and running. Good catch. I updated the template. 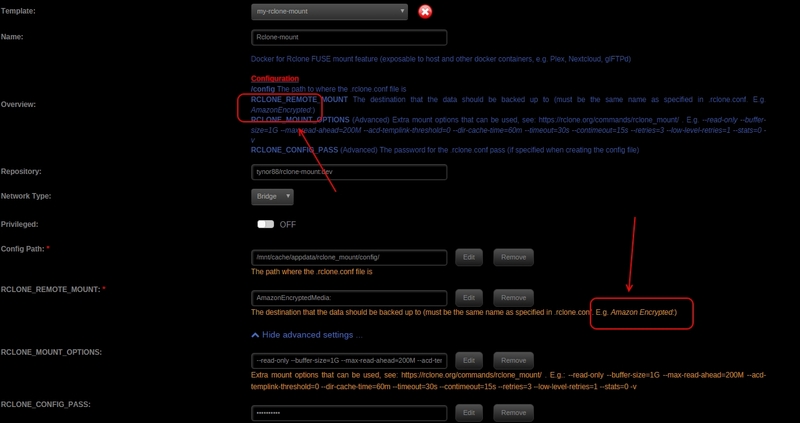 When /mnt/disks/rclone_volume was created it was owned by root with 755 permissions. Quick chown/chmod fixed it but I was getting permission errors before that. It might also be worth highlighting the ":" at the end of the value in the RCLONE_REMOTE_MOUNT key. Right, gotta fix that. I was using a folder which was created by @Waseh's plugin, so my permissions were ok. Yes, i tried to make that clear in two places. (See screenshot). But you're right - it wouldn't work without a colon. I could perhaps check the variable at startup, and fail fast if there is no ":" specified. @MTA99 What do you mean by testing with a small sub folder? It shouldn't take any time to mount. I'm mounting 5 TB encrypted data in no time. @MTA99 I see :-) But your point is good. The application can as well fail fast, as the rclone mount feature requires the colon to be there. Interesting. How many folder / files were in the directory you tried to list? Having trouble getting your template to show up. I'm adding https://github.com/tynor88/docker-templates to the Docker repositories template section. After saving, I try to add a new container from the templates and yours don't show up. Not sure what I'm missing. @jude Do you have Community Applications installed? If not, I suggest you use that. Just search rclone and it will pop up. I don't have time to write a step-by-step guide today, but later some week I can do one. This thread (including the FAQ) should get you up and running pretty fast though. Any issues you are facing right now? What is the problem ?! @sniper Have you added the necessary Extra Parameters as writtin the the OP? @sniper Have you checked the permissions for your data folder? I will fix this in the docker directly this week. I did stop other Containers and run it but still not showing up!